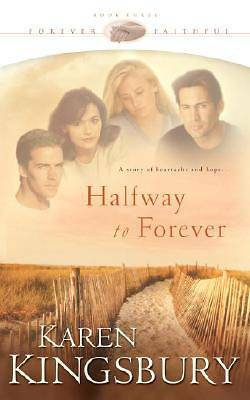 Halfway to Forever brings back two of Karen Kingsbury's favorite couples -- Waiting for Morning's Matt and Hannah, and Jade and Tanner from A Moment of Weakness -- who once again face traumatic issues. Matt and Hannah risk losing another daughter as they invest their emotions in a risky adoption, and Tanner dreads losing Jade when brain cancer threatens her first pregnancy. Kingsbury's latest heart-wringing novel tells of two familiar, beloved couples learning to depend on God daily, regardless of trials and troubles that mark the path halfway to forever. You wept with them as they were "Waiting for Morning… "
You shared their "Moment of Weakness… "
Now watch them face the greatest struggles of their lives. Matt and Hannah Bronzan have found a new life in the face of devastating loss. Together with Hannah’ s daughter, Jenny, they are finally moving forward— toward the adoption of a little girl. A younger sister for Jenny, a daughter for them to love and raise together. But just when the dream seems to be coming true, disaster strikes. Can Hannah survive the loss of another daughter? Jade and Tanner Eastman love the Bronzans. Matt and Tanner are partners in a successful religious freedom law firm, and the two couples share a great deal. Not the least of which has been Jade and Tanner’ s struggle to have children. When they discover Jade is pregnant, their joy is boundless. Until the rest of the news hits… and suddenly what should be a joyous event becomes a threat to Jade’ s very life. Will Tanner come through decades of loneliness only to face losing Jade one final time? Caught in a desperate battle against all thatthreatens to derail their faith and sideline their futures, these four struggle together to depend daily on God, regardless of what comes against them, as they journey halfway to forever.